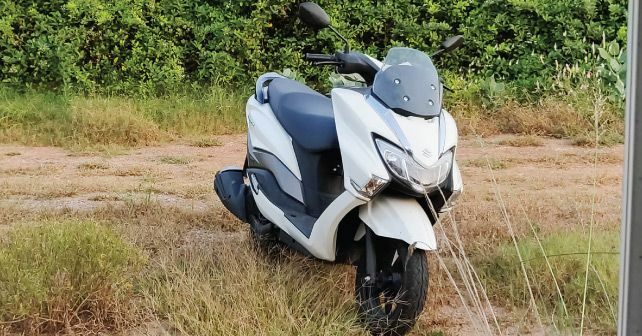 This month I spent a lot of time on the Burgman 125, and I have gotten very used to the way it handles and I have to say that the more I ride the scooter the more I fall in love with it. I use the bike primarily to go to work and occasionally to the market or the gym. When I ride to work, I usually have a backpack, my lunch box and a few other things with me. The Burgman allows me to store everything perfectly. I can hang my lunchbox on the hook under the handlebars, I can place my wallet and cellphone, and any other items in the front storage compartments, and I can keep a few other essential bigger items including my backpack under the seat. This makes it easier and more comfortable to ride the scooter without having anything extra on me. Now, usually when I go to the gym, my workout attire doesn’t have pockets, so once again I can store my phone and wallet and my protein drink in the many number of compartments. It’s completely hassle-free. The same goes for when I am shopping at the local market. Besides the space, the bike handles very well, and the engine is peppy and very smooth. What I also really love is how the combi brake system performs, and how nicely the brakes bite to give you fantastic stopping power. Overall, the Burgman is the most comfortable and the most practical way to move around town.